CML Microcircuits is pleased to announce it is now offering increased design support for the rapidly-expanding global market digital mobile radio. With its latest product offerings, designers can now easily develop dual-mode (digital/analog) radios for wearable and personal radio formats operating at up to 2W and 5W, targeting short- and medium-range transmissions respectively. As the market for voice radio operating within the licensed spectrum continues to transition from analog to digitally-encoded transmission, OEMs require solutions that can support both modes of operation. The SCT9389 is design example for a highly integrated dual-mode solution that comprises the SCT3268TD Digital Baseband Processor with embedded host controller, RF transceiver and RF power amplifier in a single small form factor design (48 x 35 mm). Designed specifically to comply with European standards, the SCT9389 employs CML Microcircuits’ proprietary direct conversion technology and is supplied with the entire protocol stack embedded within the device, including the physical layer, data link layer and call control layer. Adopting a proven RF solution significantly speeds development time particularly for those less familiar with PMR requirements. The SCT9389 design supports analog (clear voice, CTCSS, DCS), digital voice (dPMR, DMR – private and group call), digital data (short message) and digital supplementary service (dPMR/DMR). To further support the transition from analog to digital, the SCT9389 design features automatic detection and switching between analog and digital modes. It is aimed at small (wearable) digital mobile radios operating at up to 2W system power. 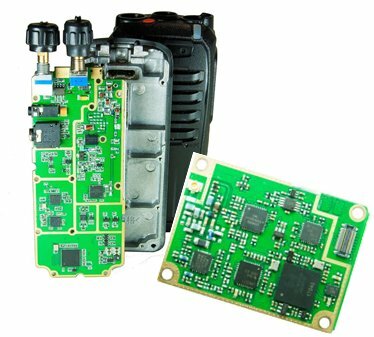 In addition, CML Microcircuits has developed a range of reference designs that provide a turnkey solution for digital mobile radio design. Available to qualifying customers free of charge, the reference designs comprise Gerber files and Bill of Materials, as well as all firmware and software required to develop a dPMR/DMR/Analog mobile radio. As an example, the SCT9366D is a design example based on the SCT3258TD Digital Baseband Processor, suitable for devices intended to operate at up to 5W transmit power. CML China, trading as Sicomm Communication Technologies, is a professional IC design house located in Wuxi and Shanghai, China. Sicomm specialises in high quality, leading edge designs for digital voice radio, focusing on high volume, high integration and low cost digital voice radio solutions.